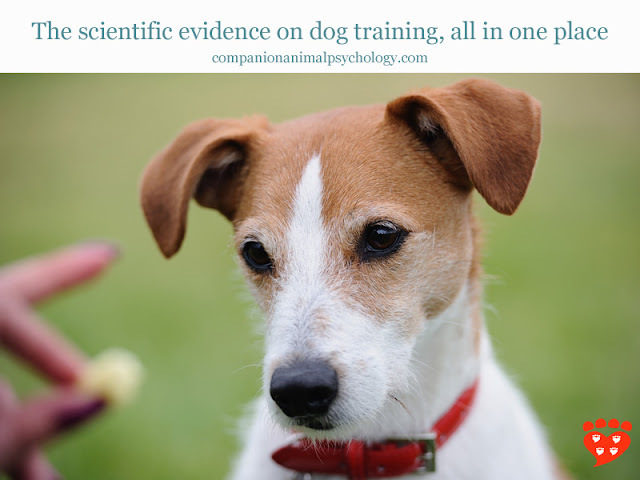 The scientific evidence on dog training, conveniently located in one place, with links to research papers and blog posts. If you are interested in the science of dog training, this is the place to start. This page includes links to scientific research studies on dog training and related topics, as well as links to places where you can read about those studies (coverage on this blog and elsewhere). So if you aren't sure if you want to read the full academic paper, you can read a summary first. The first section lists scientific research on dog training methods (positive reinforcement vs aversives, shock collars etc). The second section looks at other aspects of the science of dog training (body language, preference for types of positive reinforcement, etc). This page is updated regularly. If you have suggestions for additions, please send an email (address in the sidebar, click the hamburger menu in the top left if you don't see it). 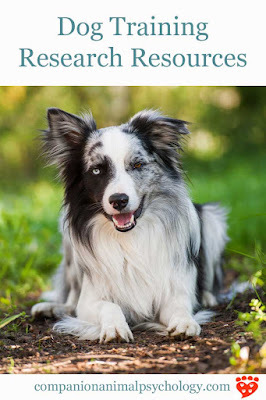 If you want to start with a summary, you might like my series on the science of positive reinforcement dog training or seven reasons to use reward-based dog training. And if you want to know more about the practical aspects of how to train a dog, start with my user-friendly guide to positive reinforcement in dog training. There is now also a sister page on the science of cat training. To stay up to date on the science of people's relationships with their pets, subscribe to Companion Animal Psychology. Covered by Companion Animal Psychology: How Many People Use Electronic Shock Collars? Covered by Companion Animal Psychology: Dangerous Dogs: Time for a Rethink? Defra AW1402 (2013) Studies to assess the effect of pet training aids, specifically remote static pulse systems, on the welfare of domestic dogs. University of Lincoln / University of Bristol / Food and Environment Research Agency. Final report prepared by Prof. Jonathan Cooper, Dr. Hannah Wright, Prof. Daniel Mills (University of Lincoln); Dr. Rachel Casey, Dr. Emily Blackwell (University of Bristol); Katja van Driel (Food and Environment Research Agency); Dr. Jeff Lines (Silsoe Livestock System). Defra AW1402a (2013) Studies to assess the effect of pet training aids, specifically remote static pulse systems, on the welfare of domestic dogs; field study of dogs in training. Final report prepared by Prof. Jonathan Cooper, Dr. Nina Cracknell, Jessica Hardiman and Prof. Daniel Mills (University of Lincoln). Covered by Companion Animal Psychology: The End for Shock Collars? Dodman, N. H., Brown, D. C., & Serpell, J. A. (2018). Associations between owner personality and psychological status and the prevalence of canine behavior problems. PloS one, 13(2), e0192846. Covered by Zazie Todd PhD at Psychology Today: Does owner personality affect dog training methods? Covered by Mark Bekoff, PhD: Is it time to ban shock collars for dogs in all situations? Masson, S., Nigron, I., & Gaultier, E. (2018). Questionnaire Survey on The Use Of Different E-Collar Types in France in Everyday Life With A View To Providing Recommendations for Possible Future Regulations. Journal of Veterinary Behavior. Covered by Kerry Lengyel at American Veterinarian: Study shows no credible evidence justifying electronic shock collars. Todd, Z. (2018). Barriers to the Adoption of Humane Dog Training Methods. Journal of Veterinary Behavior: Clinical Applications and Research. 25C(28-34). Available for free via this link until 9th June. Covered by Companion Animal Psychology: Why don't more people use positive reinforcement to train dogs? Guest post by Zazie Todd, PhD at the Academy for Dog Trainers: The Double Advantage of Reward-Based Training. Covered by Companion Animal Psychology: Can dog training books be trusted? Covered by Companion Animal Psychology: How Often Should I Train My Dog? Covered by Companion Animal Psychology: Now Where's My Treat? Feuerbacher, E. N., & Wynne, C. D. (2014). Most domestic dogs (Canis lupus familiaris) prefer food to petting: population, context, and schedule effects in concurrent choice. Journal of the experimental analysis of behavior, 101(3), 385-405. DOI: 10.1002/jeab.81. Covered by Claudia Fugazza for Do You Believe in Dog? Covered by Companion Animal Psychology: Is it Important to Attend Puppy Class? Covered by Companion Animal Psychology: Do Dogs Get That Eureka! Feeling? Covered by Companion Animal Psychology: Do dogs run faster for more treats or better quality treats? 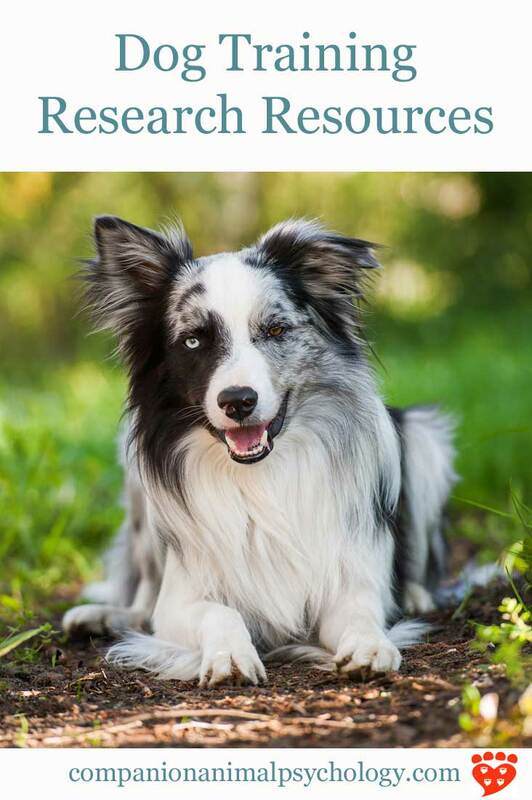 Covered by Sienna Taylor, MSc, in a guest post for Companion Animal Psychology: To gesture or not to gesture in dog training? Covered by Stanley Coren, PhD. My name is Rafael and I'm from Brazil. I want to adopt a puppy but before that I know I need to learn a lot about behavior and how to educate them correctly. I've been searching in Brazil for similar content but could not find it. I found your site through a recommendation of the best 100 blogs about dogs and when I saw your story, I could not believe it. There's a lot of interesting stuff. Too much content that will be very useful in this step. Hi Rafael, I'm glad you found it useful! Best of luck with getting a puppy.